Housing officials in Newcastle have been criticised after plans to build a new wood-burning biomass plant in the east of the city were announced. The proposal attracted public concern following a scandal involving biomass processing in the area between 1979 and 1999. The Byker Wall biomass incinerator burned waste products for two decades before it was shut down. 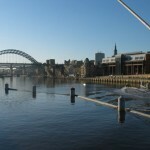 In 2000, Newcastle Council was prosecuted after tests revealed as much as 2,000 tonnes of harmful ash was released into the atmosphere. The ash tested positive for significant quantities of dioxins that were known to cause cancer. Councillor Veronica Dunn has attempted to allay the public’s fears by insisting that the new biomass boiler would be entirely different from the old incinerator. Councillor Dunn commented: “The Forestry Commission supports the use of biomass boilers. “The ash is very high in potash content and is very much sought after by farmers and gardeners. I think there’s a history of concern in Byker regarding the similar plans for an incinerator. This is a different type of application completely”. Director of St. Peter’s Marina, Brian Hunt, countered: “People just don’t want it [biomass]. I’ve been here for 20 years and I suffered from the incinerator when there were fumes all over this place”. Mr Hunt added that biomass technology has been shown to produce ash residue, which is why people in Byker are so concerned about a new wood-burning plant. Newcastle Council’s Chief Executive, Barry Rowland, insisted that the biomass plant is necessary to help tackle fuel poverty in the local community. Biomass central heating provides housing firms with a relatively cheap and environmentally friendly way to generate energy. Although carbon emissions are produced by burning wood pellets and other biomass fuel sources, the technology is said to be carbon neutral because the amount released is equal to the amount of CO2 absorbed by the natural materials before they were converted into fuel. In local communities, the energy generated by large biomass boilers is proving to be a cost-effective alternative to mains gas. Biomass plants can produce sufficient energy to provide heating and hot water to local homes. Whether ash residue is a cause for concern in Byker remains to be seen. Surely they will be using the most up to date emissions technology. I take little interest in anti biomass jibba jabba – a lot of it has come from anti coal – pro natural gas and electric indoctrination from that wolf in green clothing sustainable development movement.